TV Patrol anchor Noli De Castro once again earned netizens' ire after asking if the thieves who victimized a DLSU student are from Ateneo. "Hindi kaya taga Ateneo yan (Are they not from Ateneo)?" 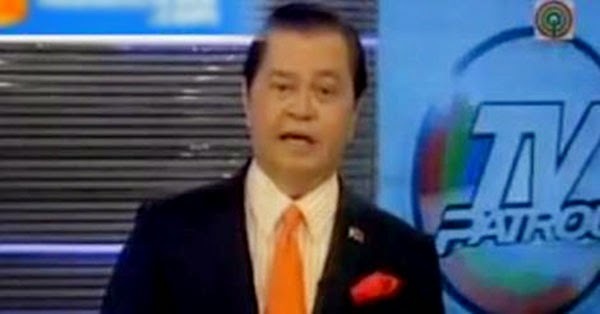 the veteran news anchor asked, referring to the suspected "Salisi Gang" members who were caught on video robbing a student of De La Salle University of over P40,000 worth of gadgets and other valuables last Wednesday. De Castro was quick to say he was just kidding after his co-anchor, Ted Failon, told him not to make such joke. "Joke lang po, joke lang," he said moments before delivering the closing spiels for Friday's episode of ABS-CBN's flagship newscast. "Hindi kaya taga-Ateneo 'yan?" –Noli de Castro referring to a thief who stole from a DLSU student. Ladies and gents, Philippine News. Bakit ang Ungas ni noli de castro? Pati nanakawan na Tga La Salle mgjojoke pa ng Baka Atenista kumuha? Baduy. This is the second time this year that netizens slammed De Castro for making a side comment. In early January, the TV Patrol anchor was criticized online for being "rude" to reporter Winnie Cordero. The former Vice President became a trending topic on Twitter after the broadcast.